Every November, families in the United States celebrate Thanksgiving -- a special day of family, feasting, and thankfulness! In celebration of the upcoming holiday, we're sharing our favorite Thanksgiving stories starring girls and women. 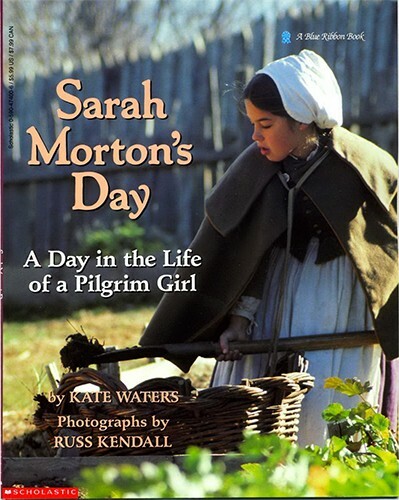 Of special interest to many of our supporters will be two children's biographies about Sarah Hale, the woman responsible for Thanksgiving becoming a national holiday. Born in 1788, the little known heroine of Thanksgiving believed that the young nation had too few national holidays that unified people across the country. At the time, Thanksgiving was celebrated in certain states primarily in the North and was observed on different days in different locations. Hale sought to create a single holiday that would help unify the nation around a single day of gratitude for one's blessings. For 36 years, Hale lobbied presidents, governors, and businesspeople to support her cause. Finally, in 1863, President Abraham Lincoln, who saw the benefit of such a unifying holiday during the stress of the U.S. Civil War, supported legislation to establish the new national holiday. With Lincoln's proclamation declaring a national day of Thanksgiving on October 3, 1863, Hale's 36-year quest for Thanksgiving was finally a success. 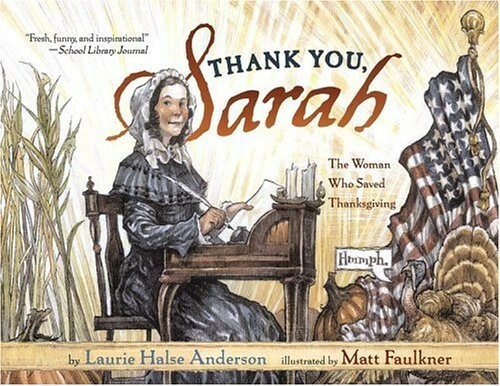 Whether it's a biography about the determined Sarah Hale or a fictional story about family fun on Thanksgiving Day, the stories featured in this post are sure to remind your children of all the reasons they have to be grateful! In addition to the titles below focused on Thanksgiving, you can find more Mighty Girl stories that teach the importance of gratitude in our Gratitude & Appreciation book section. For more stories about special holidays, visit our Holidays & Celebrations Collection. Ladybug Girl is grateful for so many things — for her friends (like Bumblebee Boy); for Bingo, her dedicated companion; for trees that you can swing from, climb up, or snooze under; and of course, for her family who are always there for her! 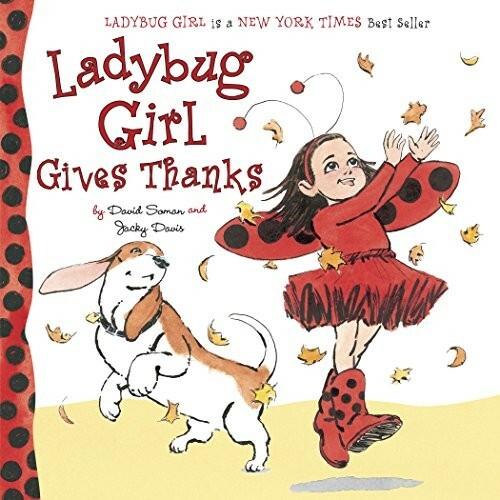 In this charming board book starring Ladybug Girl, this irrepressible character draws out the simple moments of every day life that give us many reasons to be say thanks. It's perfect for inspiring gratitude, both during Thanksgiving and throughout the year. It can be hard for a child living today to imagine just how much the Pilgrims had to be grateful for! This book follows 9-year-old Sarah through a day in her 1627 settlement. From the rooster's crow at first light, her day is full of hard work, from lighting the fires for breakfast to feeding all the animals to studying her letters. But there also moments just like in a modern child's day: squeezing in some fun with a friend when chores are done and worrying about fitting in with a new stepfather in the family. The whole story is recreated with beautiful photographs of interpreters at a recreated site; it's sure to bring the reality of life in the New World home to children today. 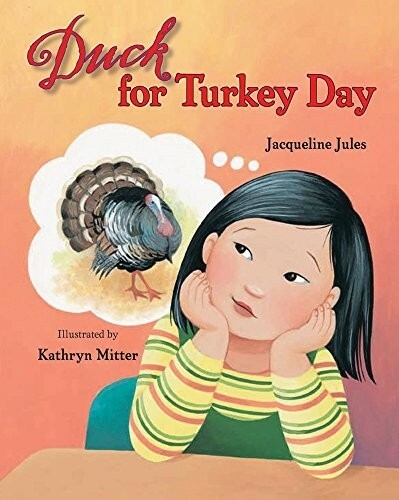 Thuyet is excited for a Thanksgiving meal and day off school, until she realizes that her Vietnamese American family is having duck, not turkey! She worries about what her teacher and the other kids will things. It is a proper Thanksgiving with a duck on the table? Thuyet enjoys her dinner, but the real surprise comes on Monday, when she discovers that the kids in her class had everything from roast beef to lamb to enchiladas...and that the common denomination is gratitude and family! This charming story is perfect to remind kids that there is no "right way" to celebrate. 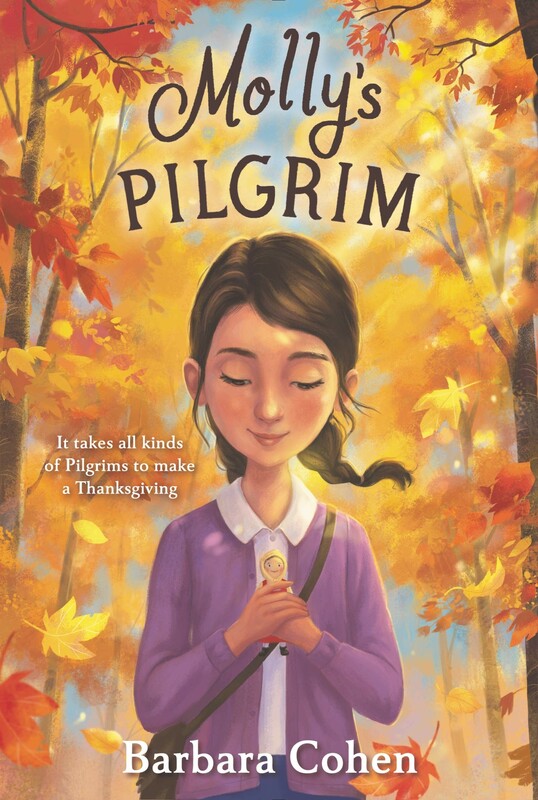 Most days, Mary loves living in America... but it's Thanksgiving, her family has little food for a celebration, and she just wishes she could go back home to Ireland. Even the neighbor's gift of a pumpkin pie doesn't seem to help. So her father tells her the story of the five kernels of corn the Pilgrims placed on their plates to remember five things that always deserved gratitude, even in tough times. Perhaps Mary can find her own five kernels to give her strength as she builds a new home. This relatable story will encourage kids to think about what makes them say thanks. From the moment the day begins at Maggie's grandma and grandpa's house, Thanksgiving is in full swing! There's a turkey to go in the oven and plenty of other delicacies to prepare; Maggie even chips in by peeling potatoes. Meanwhile, the house is filling with relatives — glamorous aunts, crying babies, strange dogs, and acrobatic cousins are in every nook and cranny, and everywhere you go, there is laughter, chatter, and even a mysterious gift or two. But the best part is when Grandma rings the dinner bell and everyone gets to say thank you for this very special day. Kids will especially enjoy the busy, detailed illustrations, with lots of secrets to discover as they read this book over and over. What are you saying thanks for this Thanksgiving? 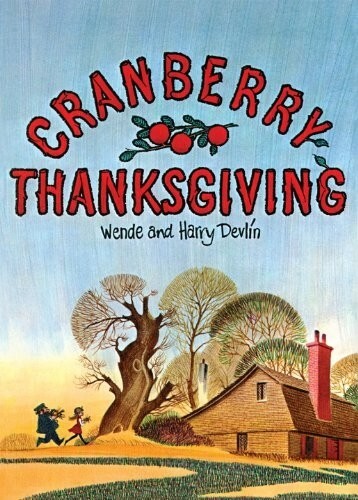 The kids in this book have a lot to be grateful for, from a delicious turkey on the table to school that makes them feel smart to cozy cuddles on a cold night. Most important of all, they're thankful for being able to share it all with loving family and friends! 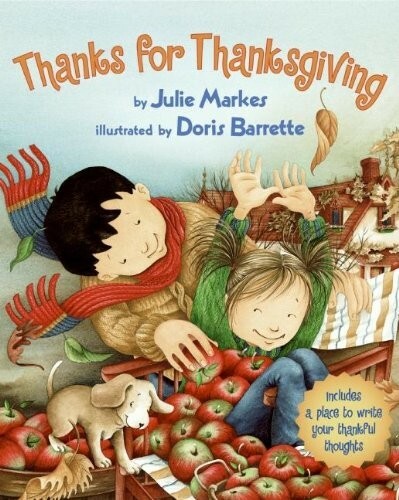 This cheerful book with whimsical illustrations full of detail also includes a page to write your own thankful thoughts. When "skirts were long and hats were tall," the American people seemed to be forgetting Thanksgiving altogether. But one determined woman, Sarah Hale, refused to let the holiday die. And she was ready to make a nuisance of herself until she was sure Thanksgiving would be remembered forever! Acclaimed author Anderson takes a funny, irreverent tone in this story focusing on Hale's efforts, while Faulkner uses caricature-like illustrations for visual humor — including one image of Sarah and other women storming a state house with a quill for a battering ram! End notes include more details about the history of Thanksgiving, as well as encouragement to the reader: "Pick up your pen. Change the world." Every year, Grandmother makes a point of telling Maggie to invite someone to Thanksgiving dinner: "Ask someone poor or lonely," she says. But when Maggie invites the unsavory Mr. Whiskers, Grandmother is in a tizzy. The highlight of her Thanksgiving is her famous cranberry bread; is the recipe safe with Mr. Whiskers in the house? But maybe it's not Mr. Whiskers that should be making Grandmother wary.... This classic from 1971 has now been reprinted, complete with a recipe to make your own cranberry bread. Rettie is facing a lot of challenges in 1918: her father is away, fighting in the Great War, and her mother is sick in bed with consumption. Even still, Rettie is managing to take care of her younger siblings, nurse her mother, and even make a little money washing rags and cleaning the halls and stairs of their building. 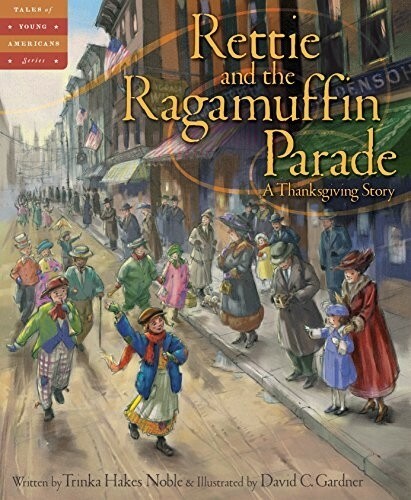 Thanksgiving Day's Ragamuffin parade, where children dress up for pennies, would make a huge difference to her family...but the influenza epidemic has Rettie worried the parade will be cancelled. This powerful story about a slice of American history culminates in a Thanksgiving full of gratitude for many blessings. Molly is a Russian Jew, a new immigrant to America, and her classmates mock her for everything from her accent to her dress to her customs. Before Thanksgiving, Molly's teacher assigns a unique project: each child will make a clothespin doll for a diorama, and Molly is assigned to make a pilgrim. But when she tells her mother that pilgrims are people who came to America to be free from persecution, the resulting doll looks a lot more like a Russian immigrant than a traditional black-clad Pilgrim! Fortunately, Miss Stickey explains that, since Thanksgiving is based on the Jewish holiday of Tabernacles, Molly's pilgrim is probably the most appropriate of all. 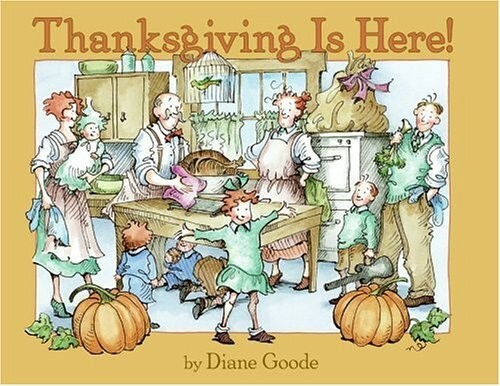 This charming story, which features the little-known origin of the Thanksgiving holiday, also provides a moving lesson about acceptance and individuality. For more stories about special days, including Thanksgiving, visit our Holidays & Celebrations Collection. For books about the early settlers of the US, visit our Colonial US History Collection. For more books about American history, visit our United States History Collection.